A public inquiry has started in Kenya into the infamous Goldenberg affair, which involved four men swindling the government out of millions of dollars. The Goldenberg affair, while dragging on for more than a decade, has yet to see any convictions. "Nothing in the public perception has come to epitomise corruption as the Goldenberg Affair," attorney general Amos Wako said during the inaugural ceremony of the inquiry commission on Friday. The Goldenberg International company is accused of receiving hundreds of millions of dollars of payments for diamond and gold exports during the rule of former president Daniel arap Moi. But the exports turned out to be fictitious. The Goldenberg scheme is said to have involved as much as $1bn. The payments were part of an export compensation scheme for commodities run in the 1980s and 1990s, during Mr Moi's presidency. 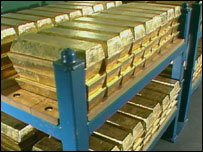 But money was paid for commodities of which Kenya either produced little (gold) or nothing at all (diamonds). Mr Moi was ousted last year by president Mwai Kibaki's National Rainbow Coalition, which campaigned on a strong anti-corruption ticket. Several of the players involved in the scam, including Goldenberg owner Kamlesh Pattni and several government officials, have been prosecuted but never convicted. Appeals Court Judge Samuel Bosire was named as chairman of the panel, which will recommend who should be prosecuted or investigated further.